Did you know that an average residential solar panel system can reduce carbon monoxide emissions by more than 200 tons each year? What an incredible impact just one home can have! Solar panels first hit the market in 1956, and space programs were one of the first industries to use solar panels to power their space crafts. Since then, their popularity has gone through the roof (no pun intended). 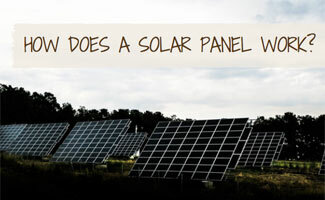 So read on to learn more about “how does a solar panel work?” and share how much money you can save while going green. Solar panels are made up of many PV cells that link together. Each PV cell contains two layers of semiconductor materials, similar to materials in computer chips. When sunlight hits the cells, it knocks electrons loose from their atoms. As these electrons flow through the cell, they generate direct current (DC) electricity. Each solar panel houses an inverter, which converts DC power into alternating current (AC) electricity and allows the solar panel to power your home’s appliances and electronic systems. If you use solar panels, your home is not 100% powered by sunlight. In the morning when the sun rises and at night when it’s dark, your home draws electricity from your utility company’s grid. Usually it’s at a reduced rate from credits received due to over-consumption during the day when your solar panels are producing more power than your house needs. By contributing that power back to the utility company’s grid, you will be paid by the utility company at the same rate that they charge others (as required by law) in a process known as “net metering.” They then sell the excess energy they buy from you back to nearby homes. Essentially you’re creating a mini-grid for your neighborhood and using solar energy to help others too. 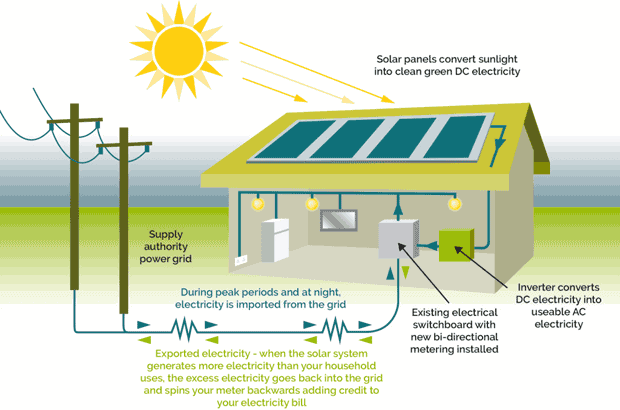 This graphic from Environmental Energies helps explain how the solar panel system works. Solar Panels – a flat, reflective-looking panel that captures sunlight to turn into DC electricity. They are joined into “arrays” and mounted either to the roof of your home (usually southward facing to get maximum daylight), free-standing or on the ground (not common especially for areas with snow). They can be either fixed non-adjustable mounts or tracking mounts which can adjust the angle to get optimal light. Some home supply stores, like Lowe’s and Costco, sell solar panel kits that can save you a ton of money. However, depending on where you live, you may be required to use a certified company to install the panels (in addition to getting all the necessary permits). So we recommend going with a professional versus DIY installation, especially since electricity can be dangerous. Read our best solar panels comparison for an in-depth comparison of the top-rated companies that can install solar panel systems to find one in your area. Less than you think! Thanks to technology and more efficient systems, residential solar panel costs have dropped nearly 45% since 2010, making the initial cost significantly less than it used to be. In addition, you can get a 30% federal tax credit for systems installed before 2020 and most states also offer local tax incentives too (check this website to check eligibility in your area). Not to mention the rebates up to 20% that many companies offer for purchasing equipment. In fact, rebates and solar energy credits can offset up to 90% of the cost of a residential solar power system in some areas of the U.S. Be sure to check local city and state opportunities. Let’s say you purchase a solar panel system for $20,000. You’ll receive a 30% tax deduction ($6,000) plus, let’s say you get a 20% rebate ($4,000). The total cost is down to $10,000. If you are paying $250 in monthly utilities before installing solar, your equipment could be paid for in a little over three years. Not to mention the long-term cost-savings and helping to reduce your carbon footprint. Another way to get the benefits of solar without an initial investment is to lease the equipment for $0 down. That way, you’ll pay nothing out of pocket upfront, but still enjoy the benefits of a reduced energy bill that’s usually less than your monthly payment. And when your lease is up you can return the panels or upgrade to a newer system. Note: if you lease a system you are not qualified to receive the tax credit. Looking for information on solar? Check out our Solar 101 guide to learn how you can get started. Check out this video by THE LIST to see an excellent summary of solar panel savings. According to the Solar Energy Industries Association, the U.S. solar market is growing at a record-breaking pace. The residential solar industry in particular is booming, with more companies offering solar panel systems for homes in a growing number of states. Ready to get started? Check out our best solar panels on the market article and you’ll be using sunlight to light up your home in no time! Why are you considering going solar? Yes. Electricity and air pollution stemming from fossil fuel plants makes up more than one-third of the total U.S. global warming emissions, according to the Union of Concerned Scientists. As a result, pollution in the air can wreak havoc on the community’s health. Renewable energy sources, like home solar panels, produce very little to no pollution. I’m no scientist but I’m an activist who’s passionate about learning more about this topic so this helped a lot!